By asking the questions below, you'll be able to get a better idea of the specifics of your Visitor Management needs. Answering these questions isn't going to recommend SKU A vs. SKU B; instead, these questions are designed to offer insight into what you're looking for on the whole, allowing you to move forward with more information to begin shopping. 1. Do you want it to expire? 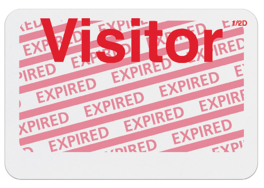 When it comes to visitor badges, there are two major kinds: badges that expire and badges that don't. Deciding which style of badge you'll be using is a key first step in determining what your options will be going forward. Expiring badges use patented migrating ink technology to show an expiration indicator after a certain time frame (usually a half day, full day, three days or seven days). The expiration indicator appears gradually, and shows fully when the badge is expired, preventing reuse. Expiring badges offer more security than non-expiring badges, but are a bit more expensive. Non-expiring badges are simple badges that are usually made of paper. They're not all that different from simply taking a piece of paper and sticking it to your guest. They're the most affordable option. However, there's nothing to prevent a paper badge from being reused in the future, creating potential security issues. 2. How will you be personalizing it? Handwritten badges are customized by hand (just in case that wasn't obvious). These badges are a quick and easy solution, as they require no software or printers for use. Simply grab a pen, pencil or marker and add the information you need. These badges are affordable, but can look a bit unprofessional depending on one's handwriting. Printed badges require the use of a printer to add the variable information. Direct thermal label printers are the most common kind of printer used for visitor badge applications, though inkjet printers can be used as well. Printed badges are professional, but require software and hardware for use, making them a bit more expensive. 3. Do you need role recognition? 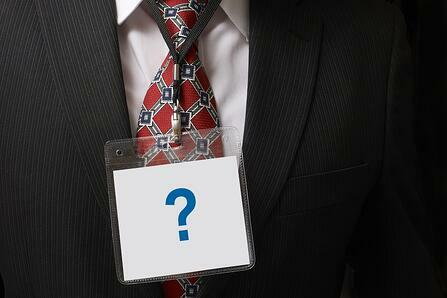 In the case of visitor badges, role recognition refers to identifying the type of guest wearing the badge. Some organizations consider everyone a visitor, while others differentiate between visitors, contractors, temporary workers, etc. 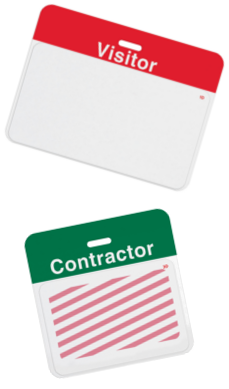 Use a badge with a printed title if role recognition is important to your facility. Printed titles, like "CONTRACTOR" or "GUEST," help more specifically identify the nature of a visit. Using visitor badges of different colors can accomplish a similar goal, provided your staff knows what each color represents. Use blank badges if all of your visitors are of the same type or if role recognition simply isn't important for your facility. 4. How will your guest wear the badge? Once your badge is personalized, you'll need to give it to your guest. Determining how you want your guest to wear the badge goes a long way toward helping you select your options. Adhesive visitor badges require no additional accessories: simply peel off the back and stick the badge to the wearer! These badges are an affordable solution, but can lose their stickiness over time. Clip-on visitor badges require the use of a plastic clip, strap clip or badge reel for use. These badges usually have a slot in them that makes them easy to attach. They are slightly more expensive, as they require an accessory for use, but they're a bit more secure than adhesive badges. Our new interactive selector tool makes it easy for you to find the visitor badges you need! This tool allows you to select the criteria that matter to you, like attachment type or personalization method, and shows you only the visitor badges that meet those needs.